They were blamed for planting too many trees, using too much water and worsening the effects of California’s epic drought. The state’s almond farmers responded by expanding their orchards in a bold wager that the sky-high prices the world was paying for almonds justified both the water use and long-term investment. Now those farmers are dealing with a steep drop in prices – and wondering if the great almond boom that transformed Central Valley agriculture is starting to fizzle. Almond prices in California have dropped significantly in the past few months. A farmer who could sell a pound of almonds for nearly $5 last summer is now getting as little as $3.10. Farmers say a downturn was inevitable after years of rising prices and an explosion in production. Almond prices got so high that some consumers and food manufacturers started turning to other nuts they could use as substitutes. Recent developments in the global economy also have depressed prices, including the weakening of economies in key markets such as China. The consequences extend beyond the livelihoods of the state’s 6,000 or so almond growers. Much of the Central Valley economy has come to depend on almond farming, as lower-value crops such as cotton and alfalfa have surrendered land to new orchards. Land devoted to almonds jumped from 590,000 acres in 2005 to an estimated 890,000 acres last year, according to the Almond Board, a grower-supported association. Farmers added 20,000 acres of almond trees last year alone. This happened even as critics questioned the shift of massive acreage to a permanent crop – and a relatively thirsty one – while the state was ordering deep cuts in urban water use and struggling to juggle competing water demands. It’s not as if the price decline is bringing the almond industry to a screeching halt. Mason said prices have stabilized in recent weeks, and most experts say the industry’s long-term prospects remain strong. Even today’s lower prices are above the average for the past decade, and almond farming remains profitable for most growers, said farm economist Vernon Crowder, a senior vice president at Rabobank. Daniel Bays is one of those taking the long view. A third-generation almond grower in Patterson and Westley, near Interstate 5 west of Modesto, he replaced 80 acres of old trees last summer with a new orchard. Planting almond trees is expensive, and by the time Bays’ babies are producing nuts in three or four years, the new orchard will have cost $800,000. He said he does not regret the investment. “The family’s been farming long enough that we know things go through cycles,” said Bays, whose family farms 600 acres of almonds and 900 acres of other crops. Bays said prices of many other commodities such as tomatoes have been slipping as well. “There aren’t other crops at this point that are really looking all that much more appealing than almonds are, even with the decrease in price,” he said. Still, the price drop is unsettling in much of the San Joaquin Valley, where almonds have become king. Buddy Mendes, chairman of the Fresno County Board of Supervisors, said falling almond prices means less money spent on farm equipment, less sales tax revenue and other economic effects. “You’re going to see it trickle down,” he said. The decline also could influence whether farmers south of the Sacramento-San Joaquin Delta will agree to help pay for Gov. Jerry Brown’s Delta tunnels, the $15.5 billion plan to re-engineer the fragile estuary with the goal of improving reliability of water deliveries to Southern California cities and farms. Farmers have been questioning whether the tunnels would pencil out for them financially, and a sustained drop in nut prices could make the project an even tougher sell, said Ted Page, an almond grower and chairman of the Kern County Water Agency. 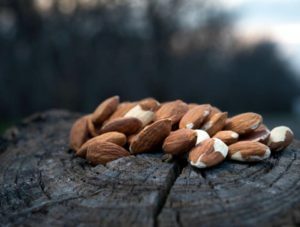 While no one’s predicting a major shift away from almonds, some experts say the decline in prices could bring a pause in the relentless planting that has seen almond acreage grow 50 percent in the past decade. A slowdown would be welcome news for many environmentalists and other Californians who argue farmers have no business planting trees in regions of the state, particularly the San Joaquin Valley, that are naturally arid and rely on water delivered by canal from Northern California. The fact that almond orchards cannot be fallowed in a drought – unlike, say, tomatoes or cotton fields – just puts more pressure on state and federal agencies to keep pumping water through the Delta to keep valley orchards irrigated. As government agencies have curtailed deliveries during the drought, almond farmers rushed to protect their $10,000-an-acre investments. They fallowed their tomato fields and other row crops to divert water to their almond orchards. They also increased their groundwater pumping to keep the trees alive. That contributed to the alarming depletion of aquifers and exacerbated the phenomenon known as subsidence, in which portions of the Central Valley are sinking. Almond industry officials counter that farmers are using water much more efficiently than they did in the 1990s, when the almond boom in California began. While almonds are a comparatively thirsty crop, farmers say there are others that require more water per pound of production. Growers also say it makes a lot more sense to use scarce water supplies on a high-value crop such as almonds, which have soared in popularity in recent years, than a low-revenue crop such as alfalfa. The Almond Board says California farmers apply 3 million acre-feet of water to their almond trees each year. That represents about 7 percent of the state’s “developed” water consumption. Put another way, the state’s 6,000 almond farmers use roughly 35 times the volume of water consumed by the 466,000 residents of the city of Sacramento last year. The state’s almond crop, valued at $2.53 billion in 2005, peaked at $6.38 billion in 2013. It dropped off to $5.89 billion in 2014, the last year for which figures were available, as water shortages cut into yields. Still, almonds remain California’s No. 2 agricultural product, after the dairy industry, and are the state’s leading farm export, far and away. California’s climate is ideally suited for almond production, and the state is responsible for 80 percent of the world’s supply and 99 percent of the U.S. supply. Almonds’ image as a healthy, nutritious snack has helped sales blossom in western Europe, China and elsewhere. Flexing its considerable marketing muscle, Sacramento’s Blue Diamond Growers became the “official snack nut” supplier of the U.S. ski and snowboarding teams during the 2014 Winter Olympics, and the company’s Almond Breeze milk alternative will be the “official almond milk” of the U.S. volleyball team at this year’s Summer Olympics. Blue Diamond declined comment for this story, referring questions about almond prices to the Almond Board. Almonds’ growing popularity naturally drove prices upward. The average price paid to growers jumped from $1.45 a pound in 2008 to $3.19 in 2014, according to the U.S. Department of Agriculture. USDA figures for 2015 are not yet available, but growers and processors say prices generally shot up to around $4.50 a pound last summer. Merlo Farming Group, which informally tracks industry prices, says nonpareil almonds, considered the premium variety, sold for as much as $4.98 a pound last July. Since then, Merlo said prices have fallen to $3.10 a pound for nonpareils. Some varieties are selling for less than $3 a pound. What happened? Some growers say prices simply got too high, prompting some consumers and food manufacturers to reduce demand or switch to alternatives such as walnuts. “When they get to $4.50 or four bucks (a pound), people aren’t going to buy them,” said Page, the head of the Kern water agency. Adding to that downward pressure: a surprisingly strong 2015 crop. Production was about 10 percent greater than expected despite water shortages, said Crowder, the bank economist. Crowder said international finance also played a role, a significant factor in a business that exports about two-thirds of its production. The strong U.S. dollar made almonds more expensive overseas, and China scaled back purchases as its economy faltered. Exports fell 14 percent in the last five months of 2015 compared with the year before, the Almond Board reported. One thing led to another: As prices tumbled, some importers in Dubai and India defaulted on purchases that had been locked in at earlier, higher prices. The price correction came faster than most analysts expected, but Crowder and others said the lower prices have customers warming up to almonds again. “Now it’s $2.75, $3,” Page said. “I think that’s more normal. Then you have … lots of use, lots of consumption at that level.